Daylight is the essential element that transforms conventional rooms into splendid spaces that add value and quality to your home and your life. And nothing brings in the daylight like a VELUX skylight. Whether it's in the privacy of a master bath or in a social area like a kitchen, VELUX skylights bring the best of the outdoors inside with you. 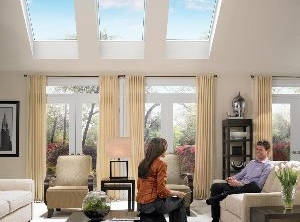 If you want to add beauty to your life and lift your spirits as you visually expand your rooms, consider the additional natural light that can be provided by skylights, roof windows, and SUN TUNNEL™ skylights.